The first in a quarterly series of events designed to galvanize the local food community takes place next Tuesday, November 4, at 5:30pm at The Red Door Restaurant & Wine Bar. Located at 741 W Washington St. in Mission Hills, The Red Door is a restaurant that takes farm-to-table to the highest level, with all ingredients sourced locally and using all meats that are humanely raised. 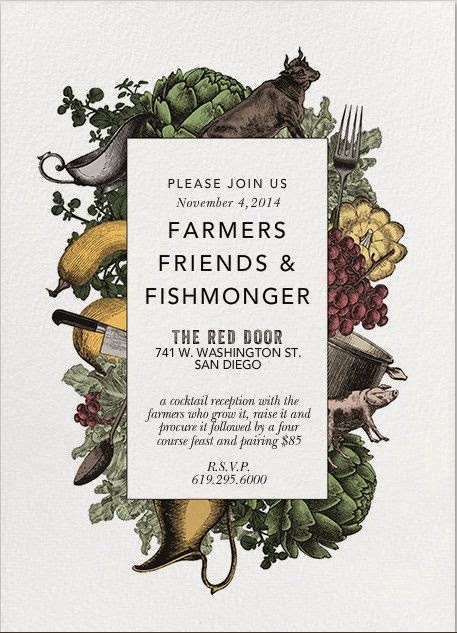 To that end, they're hosting Farmers, Friends and Fishmongers, an intimate dinner series designed to educate the community about who is producing their local food. Farmers, Friends and Fishmongers is a meet ‘n eat, of sorts, featuring a cocktail reception/mixer and four-course dinner with farm-fresh drink pairings from Julian Hard Cider. Each dish will be prepared by The Red Door’s executive chef, Karrie Hills, who is well informed of what’s in season and what can be sourced locally either from the restaurant’s own garden or from nearby farmer friends. The first dinner spotlights local fresh fish from Catalina Offshore Products and the chance to meet the company’s famed fishmonger Tommy Gomes. Other featured guests include Steve Reeb from Point Loma Farms, Krystina Asher Cook and Mikey P. Cook of Cook Pigs Ranch, and Andy Barber from Spur Valley Ranch. Tickets to this event are available for $85 and reservations are required. RSVP by calling 619-295-6000 and visit thereddoorsd.com for more details.